﻿Researchers have uncovered more evidence of a link between the brain's stress response and a protein related to Alzheimer's disease. The research, conducted on a mouse model and in human cells, were published in The EMBO Journal. The researchers found that stress causes the release of a hormone called corticotrophin releasing factor, or CRF, in the brain. That, in turn, increases production of amyloid beta. As amyloid beta collects in the brain, it initiates a complex degenerative cascade that leads to Alzheimer's disease. 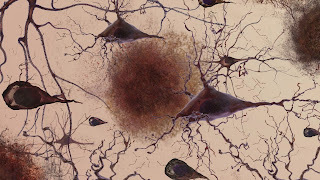 During laboratory testing, mouse models that were exposed to acute stress had more of the Alzheimer's-related protein in their brains than those in a control group, researchers found. The stressed mice also had more of a specific form of amyloid beta, one that has a particularly pernicious role in the development of Alzheimer's disease. To better understand how CRF increases the amount of Alzheimer's-related proteins, the researchers then treated human neurons with CRF. This caused a significant increase in the amyloid proteins involved in Alzheimer's disease. Specifically, the researchers found that CRF causes an enzyme known as gamma secretase to increase its activity, which in turn causes more of the Alzheimer's-related protein to be produced. The research contributes to further understanding the potential relationship between stress and Alzheimer's disease, a disorder believed to stem from a mix of genetic, lifestyle and environmental factors. The researcher are now looking at using an antibody to block the CRF receptor that initiates the stress-induced process, which could be a novel new approach to treat Alzheimer's. Based on material originally posted by University of Florida.